The trauma that the owner of casacaudill (a fellow houseblogger) is going through with her windows reminds me of the months of anguish we went through three years ago when we were replacing our windows: sleepless nights, contractor bids, disbelief at the price, more sleepless nights. Before we bought the house we knew that we would have to replace the failed double paned windows that were so fogged you couldn't tell if it was rainy or sunny outside and the huge single pane, single hung windows in the dining room, den, study and master bedroom if we were to keep warm in the winter. We tried to get rough estimates before we bought the house but it proved impossible. My best guess, as everything had to be custom, was $40,000 for all the windows, triangular, square and rectangular. As soon as we moved in I had contractors come and quote. It turned out that no one likes to install windows - not enough profit. Most contractors walked in, looked around and disappeared, no quotes there. One only wanted to install vinyl, and I couldn't do that to this house. One told us we needed to get Marvin windows, but he would only install Andersen or Pella. One wanted to remove all the siding to install. I was seriously freaked out they would reduce my house to a pile of redwood planks. Then there were the design problems. Marvin could do the custom sizes we needed cheaper than the other two big window manufacturers and their product seemed better but Town Code meant we couldn't put single hung windows in so we spent a lot of time coming up with a solution that would be the same on the exterior but would fit code. Having everything architecturally correct was very important to us. In the end we did get a quote for everything and it was almost exactly my guestimate figure. But a few months in the house had opened our eyes to what else had to be done and the thought of spending that huge amount of money just on windows was making me sick. 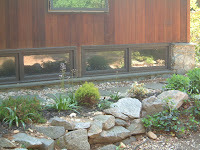 We decided that we would replace only those windows that absolutely needed it: 2 8"x3" fogged double paned windows over the garage, 2 4'x 3" in Steven's study that let water cascade in when it rained, a cracked 4'x4'window that a bird flew into the day we moved in and 8 6'x4' single pane, single hung windows. We decided we would replace the other windows as and when we needed to. This year we put in a new tempered glass window in the boys' bath as we remodeled that space. This seemed like a great solution at the time but three years on, I'm not so sure. We are still having window issues, a few of the old windows have started to fail: there are signs of moisture in the basement windows (above) and in the master bedroom; a couple of others had rot that was treated but they're now draughty and they don't operate well; we are still having trouble with design of the 6'x8' replacement window in the den (below). The cost of Marvin windows has gone up, as has the cost of labor. The fallback in real estate prices makes me nervous about return on investment so I'm reluctant to do more than I have to. The price that originally made me feel sick now seems more like money well spent. Our heating and airco bills have been lower since we had the large windows replaced and I appreciate the quality of these windows. From the outside it's almost impossible to tell which are original windows and which are the replacements. Any issues we had with the windows were to do with the installation and not the windows themselves, so we will be even more careful about choosing a contractor in the future. We will have to replace eight windows probably next year or the year after and I wish I had done them all at one go so I don't have to worry about them now. Hindsight, it's a wonderful thing. Wow. Gellar has some far out designs. It sounds like you have a beautiful home. It's nice to hear of people going the extra mile to keep their homes architecturally correct while updating. Marvin windows are on the expensive side, but as you said, it's very difficult to notice the difference from the old to the new. That is the perfect statement that explains what Marvin is all about. You are certainly not the only person to replace your windows in phases. In fact, that is the most common way it gets done. Kudos!